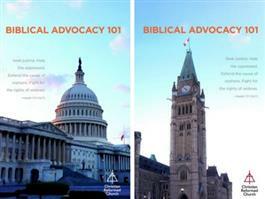 In this guide (for the U.S. or Canada) you will learn the biblical basis for advocacy, that advocacy works, and the many ways in which you can urge your members of Congress or Members of Parliament to advocate for just policies and structures that respect all people and allow all to thrive. Available for both the U.S. and Canada; you will be sent the version based on your shipping address. World Renew and the Office of Social Justice, in partnership with other organizations, has developed guidesfor biblical advocacy in the U.S. and Canada. In the guide tailored for advocacy in your country (U.S. or Canada) you will learn the biblical basis for advocacy, that advocacy works, and the many ways in which you can urge your members of Congress or Members of Parliament to advocate for just policies and structures that respect all people and allow all to thrive.